Nobel Laureate Professor Muhammad Yunus is the father of both social business and microcredit, the founder of Grameen Bank, and the founder of more than 50 other companies in Bangladesh. In 2006, Yunus and Grameen Bank were jointly awarded the Nobel Peace Prize for their work to “create economic and social development from below.” Yunas regards micro-credit both as a human right and as an effective means of emerging from poverty: Lend the poor money in amounts which suit them, teach them a few basic financial principles, and they generally manage on their own. For his constant innovation and enterprise, Fortune Magazine named Yunus in March 2012 as “one of the greatest entrepreneurs of our time.” He is the recipient of 60 honorary degrees from universities across 24 countries. He has received 131 awards from 30 countries including state honors from 10 countries. He is one of only seven individuals to have received the Nobel Peace Prize, the United States Presidential Medal of Freedom, and the United States Congressional Gold Medal. Other notable awards include the Ramon Magsaysay Award (1984), World Food Prize (1998), The Prince of Asturias Award for Concord (1998), Sydney Peace Prize (1998), and the Seoul Peace Prize (2006). 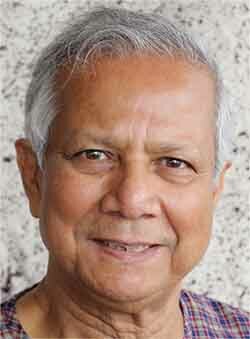 In 2006, TIME Magazine listed Yunus on its “60 years of Asian Heroes” list as one of the top 12 business leaders. In 2008 in an open online poll, Yunus was voted the 2nd topmost intellectual person in the world on the list of Top 100 Public Intellectuals by Prospect Magazine (UK) and Foreign Policy (United States). In 2010, The New Statesman (UK) listed him as one of “The World’s 50 Most Influential Figures.” He has appeared on the cover of TIME Magazine, Newsweek, and Forbes Magazine.